Dr. West earned his BS in Molecular biology from the University of Wisconsin Madison in 1990 and his Doctorate in Molecular Genetics from Princeton University in 1997. He graduated from the University of Pennsylvania, School of Veterinary Medicine in 2002. Dr. West joined Bryn Mawr Veterinary Hospital in August 2010. He has a particular interest in internal medicine and dentistry. Steve and his wife, Julie, live near Flourtown with their two young children, Ethan and Paige. They have two pets, Buster, a young Plott Hound mix from South Carolina and a cat, Mickey, who tolerates Buster with surprising patience. Julie and Steve enjoy all manner of outdoor activities including hiking, camping, biking, and running. Did you Know: Steve has had a passion for playing ice hockey, which he has been doing for several years now. Dr. Hayes received her veterinary degree in 2004 from Atlantic Veterinary College in Prince Edward Island, Canada. She was born and raised in Springfield PA, and received her bachelors degree from the University of Scranton and a masters degree from the Thomas Jefferson University. Dr. Hayes has been at Bryn Mawr Veterinary Hospital since 2009 and has special interests in cardiology, neurology, and behavior. Felicia loves the outdoors, gardening, and has particular interests in oil painting. Dr. Connelly earned her BS in Biology from Georgetown University in 1996, and her veterinary degree from The University of Pennsylvania School of Veterinary Medicine in 2004. She has worked in emergency medicine and general practice for the past 12 years and has special interest in cardiology, immune mediated disease, and soft tissue surgery. Dr. Connelly resides in Delaware County with her two children. They have two dogs, Basil Exposition, a geriatric beagle, and Scott Evil, a young cocker spaniel. Dr. Connelly enjoys figure skating, cardio kickboxing, and sampling Philly’s many wonderful restaurants. Dr. Beebe attended the University of Pennsylvania for both her undergraduate and veterinary degrees. In the interim, she received a master’s degree from Philadelphia College of Osteopathic Medicine in forensic medicine. While earning these degrees, she managed to work at Bryn Mawr Vet as a technician for close to 10 years! She then worked a stint in emergency medicine before returning to Bryn Mawr Vet as a full-time veterinarian. Dr. Beebe resides in Glen Mills with her husband and clowder of cats. They love fostering cats and kittens, then watching them flourish with their forever families. Dr. Beebe also enjoys traveling, home renovation, gardening, cooking, and crafting. Did you know: Dr. Beebe spent a month in New Zealand, working with their native species, including kiwis and penguins! Dr. Miller received his BS from Florida State University in 1972 and his MS in cardiac electrophysiology from Auburn’s College of Veterinary Medicine in 1975. He went on to receive his VMD degree from the University of Pennsylvania in 1979. He is a diplomat of The American Board of Veterinary Practitioners, receiving his certification in 1985 and recertified in 1995 & 2005. Dr. Miller is married with four children. In his spare time he enjoys golfing. Dr. Greenamyer earned her MS in Cell Physiology from the University of California, Davis in 1987. She received her veterinary degree from Ohio State University in 1972. 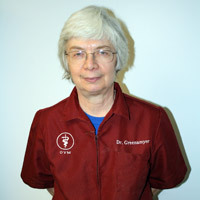 Dr. Greenamyer was also involved in the US Air Force (Veterinary Corps, then Biomedical Sciences Corps) from 1975-1988 when she resigned with the grade of Major. Dr. Greenamyer joined our team as a part time Veterinarian in 1988. Although she enjoys working with dogs, her first love is feline medicine. Dr. Greenamyer has been fully employed at West Chester University, Department of Biology, since 1988 and still enjoys teaching. When Judy is not working she enjoys her down time at home with her cat, Roxy. Judy also enjoys reading mysteries and historic fiction books. Did you Know: Judy has played 2nd violin in Immaculate Symphony for the past 20 years.